Generous George proves he’s ray of sunshine! FUN and laughter, there’s enough for everyone... at the annual Highgate Festival this year thanks to special donation from former Wham! superstar George Michael. The singer has boosted preparations for the street party in Pond Square on Saturday June 21 by handing over thousands of pounds to organisers. It is always one of the stand-out dates in the summer season of festivals and fetes. George, who lives nearby, joins the Camden New Journal as one of the festival’s sponsors. 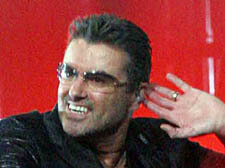 George – reportedly the most played artist on British radio – is well known to support a whole host of good causes. Four years ago, he said he had earned enough money and that in future he would release his music for free on the ­condition that fans ­endeav­oured to make donations to charity instead. Ms Nolan revealed his donation didn’t come as a shock to a community familiar with his deep pockets. “This is the first time he’s sponsored the festival but once we were able to tell people he’d helped, I kept hearing from other groups that he’d been very generous to them,” she said. But another organiser doesn’t share those concerns. Jane Hamilton said: “George Michael’s donation has allowed the festival to be the biggest and best yet and is a wonderfully generous gesture from one of ­Highgate’s most famous ­residents. Apart from the usual arts and crafts stalls and musicians on the big stage, some of the newer attractions this year will include a “kids ­corner”, a steel band, belly dancer and budding poets.